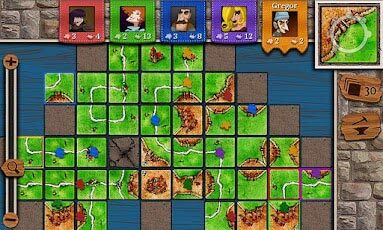 Mobile version of the award-winning tile-based board game "Carcassonne"
Includes the official expansion "The River II"
A quick look at the game and its features. Carcassonne for Android works well. I usually play against one of the many computer opponents, and each has a different skill level. It includes the River Expansion, which helps with replay value. A key advantage of a digital board game vs. a tabletop game is zero setup and cleanup time. 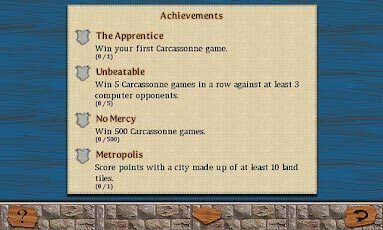 I can play a game of Carcassonne in 10-12 minutes, and scoring is done by the computer. Another feature I like is that the computer shows all legal moves or tile placements. A downside of the electronic version is the missing social aspect; most games are solo. One of the many reasons I play games is that I enjoy the social interaction with my playing partners. So even a great electronic adaptation of a game will likely seem a bit cold or sterile. Carcassonne for Android is a good value at $4.99, and being quick and portable makes it very worthwhile. I hope that other quality electronic adaptations of tabletops will be available soon. 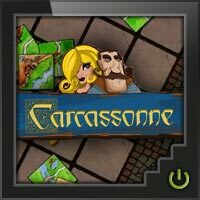 Add a Review for "Carcassonne (Android)"